On our various journeys on the VA we had observed some colliery screens near La Pereda, an unstaffed halt north of Ablaña. Here the VA and RENFE lines emerge from parallel tunnels and cross the River Caudal before proceeding on their different routes to Oviedo. The VA follows the river to Fuso before swinging eastwards to Oviedo, but the RENFE takes a more direct course by plunging into a further tunnel about three km long. By La Pereda station there emerges from the trees dual gauge track - metre and 5' 6" - which connects the VA and RENFE with the screens a short distance away near the river bank. This is the start (or finish) of a mining system owned by Hulleras de Riosa. 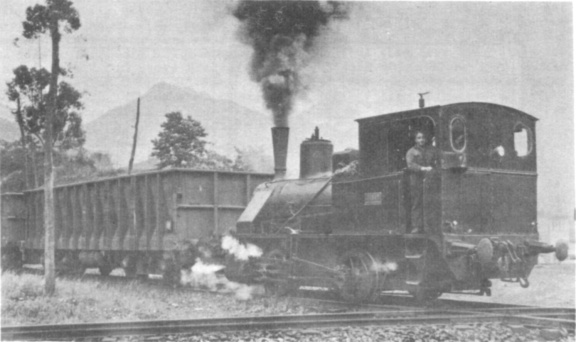 There are no metre gauge locomotives so presumably the VA works its own traffic to and from the screens; however, there are two locomotives on the 5' 6" gauge - one being an 0−4−0 well tank by Orenstein & Koppel (756 of 1901) and the other an 0−6−0 side tank bearing a plate "Gme de Decker & Cie., Bruxelles, no.1432, 1924". On the same level there is a 75 cm gauge system serving the coke ovens, operated by a diminutive Krause 0−4−0 well tank. 5‘ 6" gauge - CESAR crosses the metre gauge Vasco-Asturiana line en route to the RENFE sidings. Ascending a short incline one arrives at the higher level, and the start of the main line, also of 75 cm gauge, connecting the screens with the mines at La Foz and Riosa, some 9 km distant. Standing out of use in a siding we found a Henschel 0−4−0 side tank and an outside-framed Hunslet 0−6−2 side tank (659 of 1896), the latter being supplied originally to the Sierra Alhamilla line in Southern Spain. In the workshops we found a 75 cm gauge 0−6−0 side tank by the Vulcan Iron Works and a 60 cm gauge Orenstein & Koppel 0−4−0 well tank from the mines at La Foz. 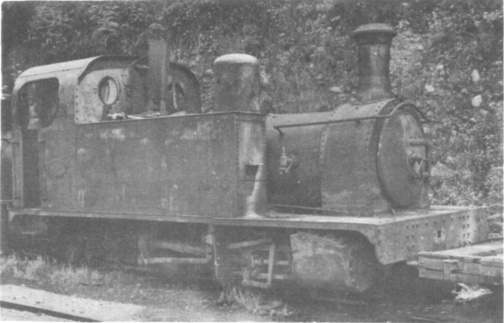 Outside were the dismantled remains of a Sharp Stewart 0−4−0 side tank (4590 of 1899) which, from its size, had obviously been used on the coke ovens line below. As we had no previous knowledge of this company we had not been able to write requesting permission for a visit but, on production of our "credentials" (a file of correspondence with other Spanish firms), we were immediately made welcome. 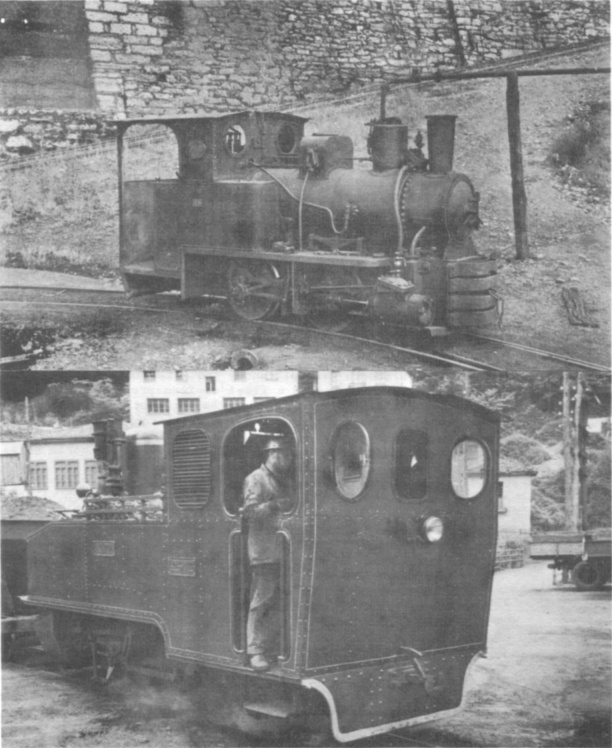 Whilst we enquired regarding the possibility of visiting the mines a train arrived from La Foz behind an 0−6−0 side tank which also carried a plate showing the builder (or supplier) to be Decker, no. 3066. Coupled to the tail of the train of loaded coal wagons were two four-wheel coaches, and we were informed that the locomotive would be returning to La Foz about half-an-hour later with empty wagons and that we could ride on the train. We sat in the sunshine watching the locomotive shunting until the time of departure when we clambered aboard the one coach included in this "up" train which was coupled next to the engine. 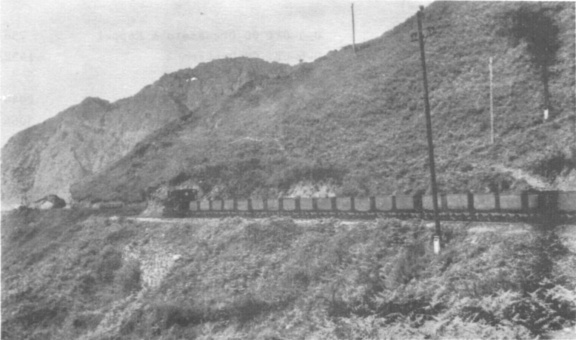 The wagons trailing behind included one loaded with coal from elsewhere for the locomotives at La Foz, where presumably the coal mined is unsuitable for locomotive purposes – not an unusual problem. Every train between La Pereda and La Foz includes in its formation one or two pass enger coaches which are quite well patronised, the trains being quite frequent and running at fairly regular times, giving a valuable service to the small communities along the line since it is the only means of communication. La Foz itself is accessible by road from Oviedo and is also served by a local bus service connecting with the VA line at Parteayer. Inside the coaches are longitudinal seats, one each side, giving a total of about a dozen seats, and a hand-brake for use on the downhill journeys - brakesmen are carried on every train. There is also a notice giving the regulations for passengers travelling on the "Ferrocarril de La Pereda a La Foz" and, since no fares are charged, the line therefore qualifies as one of the World’s free railways. Upper - On the 75 cm gauge the diminutive Krause well tank No. 5 used at La Pereda coke ovens. Note the incline in the background which leads to the main line. Lower - On the 75 cm gauge No. 6 LA PEREDA awaits departure from La Foz with a coal train for La Pereda. We were joined in the coach by some women and children who had also alighted from the VA train, and soon we were off. The line starts climbing immediately, following the valley of the River Caudal for some way, and keeps climbing higher and higher whilst the VA lime can be seen far below on the other bank. We passed a Henschel 0−4−0 side tank coming down with a loaded train, and shortly plunged into the first of many tunnels that dominate the upper part of the line. These tunnels are hewn out of solid rock - some are quite lengthy - and consequently the atmosphere in the coach became quite foul at times. After about 4 km we entered the longest of the tunnels which describes a full 90−degree turn to emerge in an adjoining valley running in a southerly direction, with high mountains on either side. Continuing our climb, through more tunnels, we eventually arrived in the yard at La Foz after a journey of about forty minutes duration. Here we were more or less at the head of the valley and we could see inclines going off in all directions to serve mine workings. Ascending a short incline we came upon the 60 cm gauge system and also found ourselves at the maim colliery level, with a modern deep pit and a fantastic narrow gauge system serving numerous drift mines operated by a fleet of flameproof mines diesels, mostly German but some English. However, outside the workshops was an Orenstein & Koppel 0−4−0 well tank, and we learned that the steam locomotives work a line high up on the mountainside at the top of a most formidable incline about twice as long and slightly steeper than the one at Penmaenmawr in North Wales! This incline is used only for the transport of materials, the coal being tipped down the mountainside through chutes. We set off up the incline in the blazing sun, encouraged by the sight of steam high above. At the top we found a gleaming Krause 0−4−0 well tank waiting to take its train around the mountain to the top of the chutes, and another Krauss was in the shed nearby. The lines into the mines on these mountain levels are worked by horses or mules, the diesels only being evident on the main level far below. Returning down the mountainside by a recommended "easy" route we arrived back at the terminus of the 75 cm line just in time to see another arrival from La Pereda, this one behind the Henschel we had passed on our upward journey. We adjourned to the local bar before joining the train for the trip down to La Pereda. This was not the end of the visit, however, since one question remained unanswered - why were two locomotives required in steam on the 5' 6" gauge section less than ½ km in length? Both locomotives were still busy marshalling some enormous bogie hopper wagons that were being filled via tips from the narrow gauge line above. There was am hour to wait for the next VA train to Oviedo and we retired to the grass between the VA and RENFE lines near the station. Our question was answered for soon the colliery train appeared from amongst the trees, a string of the hopper wagons with the Orenstein at the head and the Decker at the rear. It paused a while waiting for clearance to cross the VA line. We assisted the locomotive crew in disposing of some of their wine and, after the passing of a VA freight train, the colliery train moved across the VA and on to RENFE metals. 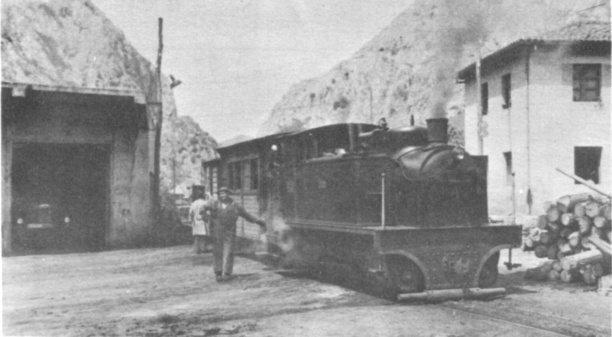 Here it reversed and with both locomotives proceeding chimney first set off along the RENFE main line through the tunnel to Ablaña. The locomotives returned later with empties but by then we were back in Oviedo after a memorable visit to a magnificent system. Photographs taken on the 60 cm gauge system on the upper level at La Foz. Upper - No.4 FIGAREDO (with nameplate on right hand side only) at the mine. 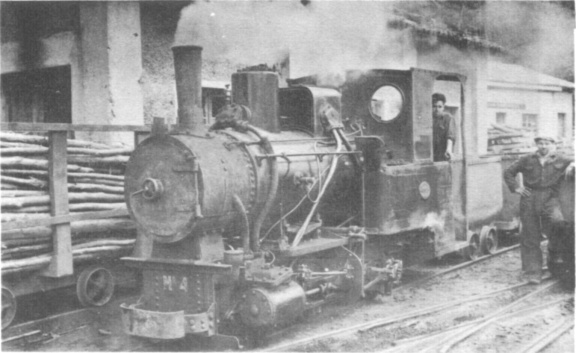 Lower - No.4 hauling a loaded train to the coal chute visible in the left background of the photograph.